We’ve put together a list of the questions that we get asked the most. If there’s anything that we have not covered on the list we would love to hear from you. Absolutely, our grass provides a clean, safe area for your kids to play on all year round and it’s 100% eco-friendly. For extra peace of mind we can install shock pads to provide additional shock absorbency and gives kids that extra little bit of protection. We highly recommend shock pads in areas where play equipment is installed. I have a pet, will this be a problem? 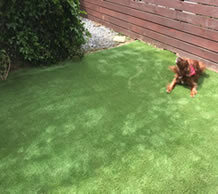 PST Lawns artificial grass is also perfect for pets – and with the added bonus of NO muddy paws! When cleaning up after your pet it’s just like any other grass area, large particles will have to be scooped up but any other particles will wash away in the rain. Does artificial grass look and feel real? Yes, huge advancements in the manufacture of artificial grass means our grass looks just like the real thing making it a clean, safe and low-maintenance alternative to natural grass. We only install the highest quality grass so your garden has a natural look all year round. We can match any garden design and our artificial grass is available in a variety of different colours to match your project requirements. Can I lay artificial grass over concrete & decking? No problem, our artificial grass carpet can easily be laid over decking and any outdoor concrete areas. Basically you can cover almost any surface with PST Lawns artificial grass. What size lawns do you install? Whether you want to revamp your entire lawn, upgrade a patio area or give your decking area a makeover, we’ve got it covered. We cater for all project sizes and would love to hear from you. Where do you install in Ireland? 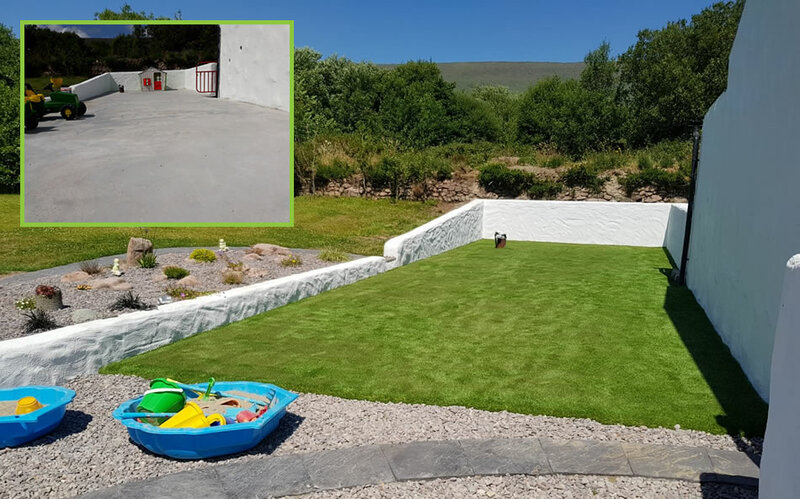 We supply and install the highest quality artificial grass all over Ireland. We have over 10 years’ experience in the industry and our team of expert installers will be able to transform your garden in no time. Will there be puddles after rain? Absolutely not, our fully trained team ensure that any base works are expertly carried out. Our grass if fully permeable ensuring that any rain water drains away very quickly – in fact up to 10 times faster than excess water on your regular grass lawn. To get the most accurate costing you can measure the area you need to cover in meters squared. Send us the area size you roughly want to cover, don’t worry, we will help you plan it in detail and take it from there. Just tell us approximately in m2 the area to be covered and we’ll provide a quotation. 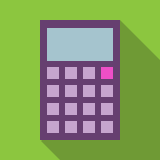 Alternatively, you can use our Quick Quote Calculator below to get an idea of what it might cost to install PST Lawns artificial grass. Before installation what do I need to do? Don’t worry we’ll look after this side of things. If base works need to be done before laying a PST Lawn our qualified and experienced team will do all of this in advance of installation. With proper maintenance our artificial grass products will last 15-20 years. How do I maintain my artificial grass lawn? Artificial grass requires very little maintenance but a small amount of work will improve the look and increase the lifespan of your new lawn. 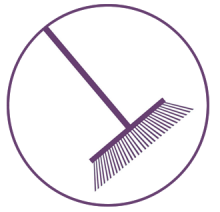 Ideally you should use a yard brush to sweep the surface occasionally which will help the fibres to stand upright and remove any debris. Here are some tips for looking after your artificial grass lawn. Our artificial grass products are UV tested meaning that the colour won’t fade over time. How is the grass secured? In general we will use dried silica sand to weigh the grass down and keep it in place. The sand infill also adds to the stability of the surface and helps the grass fibres to stand upright for longer. When installing onto concrete or tarmac surfaces we can also glue the grass down. Do I need a Shock Pad underneath the artificial grass? 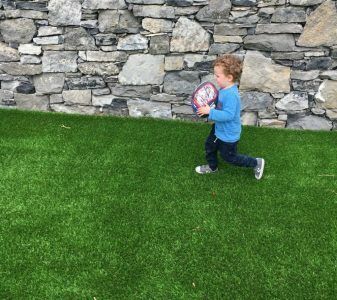 We would always recommend Shock Pad underlay for kids play areas as it provides additional cushioning underneath the grass surface. 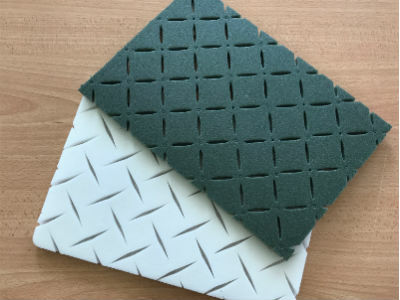 Shock Pad can also be a great option when installing onto concrete or tarmac. If the grass is for aesthetic purposes, Shock Pad is generally not required. Yes, you can! If you are a DIY enthusiast and are comfortable with carrying out some landscaping work you will be able to install our products yourself. We offer supply only on our artificial grass products and can also supply seam tape and glue if needed!